The quest to discover whether a planet orbiting our closest neighboring star, Proxima Centauri (4.2 light years from Earth), has the potential to support life has taken a new, exhilarating twist. The planet was only discovered in August 2016, and is thought to be of similar size to Earth, creating the possibility that it could have an 'Earth-like’ atmosphere. Scientists from the University of Exeter and Met Office have embarked on their first, tentative steps to explore the potential climate of the exoplanet, known as Proxima B. Early studies have suggested that the planet is in the habitable zone of its star Proxima Centauri - the region where, given an Earth-like atmosphere and suitable structure, it would receive the right amount of light to sustain liquid water on its surface. Now, the team of astrophysics and meteorology experts have undertaken new research to explore the potential climate of the planet, towards the longer term goal of revealing whether it has the potential to support life. 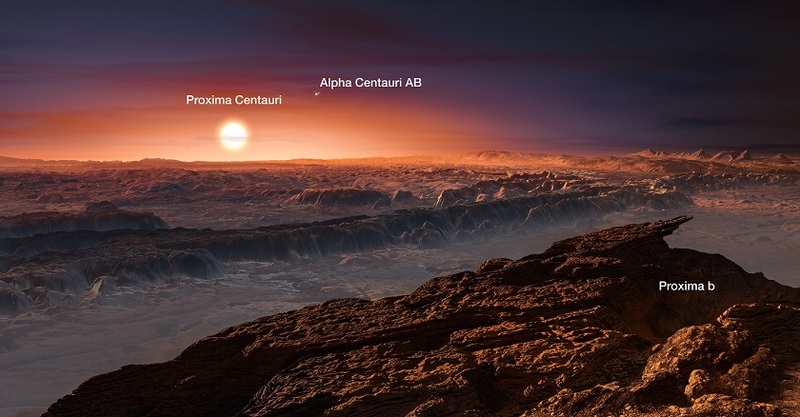 Using the state-of-the-art Met Office Unified Model, which has been successfully used to study the Earth’s climate for several decades, the team simulated the climate of Proxima B if it were to have a similar atmospheric composition to our own Earth. The team also explored a much simpler atmosphere, comprising of nitrogen with traces of carbon dioxide, as well as variations of the planet's orbit. This allowed them to both compare with, and extend beyond, previous studies. Crucially, the results of the simulations showed that Proxima B could have the potential to be habitable, and could exist in a remarkably stable climate regime. However, much more work must be done to truly understand whether this planet can support, or indeed does support, life of some form. The research is published in leading scientific journal, Astronomy & Astrophyics, on Tuesday, 16 May 2017. Dr Ian Boutle, lead author of the paper, explained: “Our research team looked at a number of different scenarios for the planet’s likely orbital configuration using a set of simulations. As well as examining how the climate would behave if the planet was ‘tidally-locked’ (where one day is the same length as one year), we also looked at how an orbit similar to Mercury, which rotates three times on its axis for every two orbits around the sun (a 3:2 resonance), would affect the environment." Using the Met Office software, the Unified Model, the team found that both the tidally-locked and 3:2 resonance configurations result in regions of the planet able to host liquid water. However, the 3:2 resonance example resulted in more substantial areas of the planet falling within this temperature range. Additionally, they found that the expectation of an eccentric orbit, could lead to a further increase in the “habitability” of this world. Dr Nathan Mayne, scientific lead on exoplanet modelling at the University of Exeter and an author on the paper, added: “With the project we have at Exeter we are trying to not only understand the somewhat bewildering diversity of exoplanets being discovered, but also exploit this to hopefully improve our understanding of how our own climate has and will evolve. The University of Exeter has one of the UK’s largest astrophysics groups working in the fields of star formation and exoplanet research. The group focuses on some of the most fundamental problems in modern astronomy, such as when do stars and planets form and how does this happen. The group conduct observations with the world’s leading telescopes and carry out numerical simulations to study young stars, their planet-forming discs, and exoplanets. This research helps to put our Sun and the solar system into context and understand the variety of stars and planetary systems that exist in our Galaxy. Exploring the climate of Proxima B with the Met Office Unified Model by Ian Boutle, Nathan Mayne, Benjamin Drummond, James Manners, Jayesh Goyal, Hugo Lambert, David Acreman and Paul Earnshaw is published in Astronomy & Astrophysics. Hey guys if you are really addicted to play free online game then here on our homepage on just single click you will play free fireboy and watergirl game online on your pc tablet and on your smartphone without any download and registration the goal of the game is to collect the diamonds.